Twenties And Fabulous by Kristen Berk: DIY: Halloween Apple Teeth! 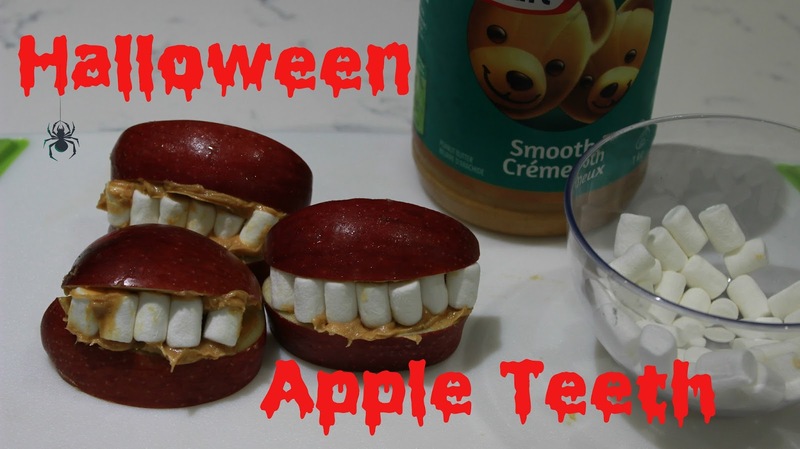 Halloween is just around the corner and what better way to get into the spooky spirit than making Halloween apple teeth. Below you will find the step-by-step process to achieve this creepy recipe. Take your red apples and slice them in half. Then take each half and slice straight down (horizontally) the apple making four quarters. You should have eight pieces in total. Take the peanut butter and cover each of the quarter slices. Now take one of the apple slice and the small marshmallows and individually place them facing the front/skin of the apple. This will help to create the appearance of smiling teeth. It's okay if there are gaps in between or it looks a bit messy, since it will create a spooky facade. To complete the smile, take one of the other apple slices and place it on top of the marshmallow- like a smile sandwich. In the end you should have a plate full of Halloween Apple Teeth! Thank you for reading. Subscribe for weekly recipes!